The science-softCon "UV/Vis+ Photochemistry Database" is the worldwide largest collection of EUV-VUV-UV-Vis-NIR spectral data and other photochemical information (e.g. 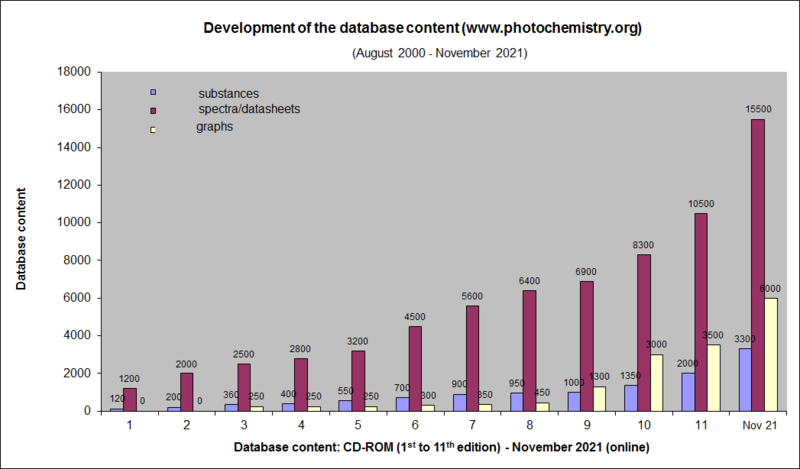 quantum yields, photolysis studies) from published peer-reviewed papers (database-development). Please find some good reasons for subscription. The following access types for the on-line "UV/Vis+ Spectra Data Base" are available. All access types includes a free copy of the latest "UV/Vis+ Spectra Data Base - CD-ROM (save up to 240 EURO!). If you have any questions or need a quote please contact our helpdesk. To order contact our helpdesk. This initiative should develope the spectral (photochemical) database towards a spectral (photochemical) data sharing platform. The advantage of such a spectral data sharing platform is that the more scientists provide their data for inclusion into the database the better is the chance for all users to find specific spectral data within the database. In addition the spectral database gets more and more interdisciplinary usable. So every user can benefit from the database especially if their University/Governmental Organization has permanent access to the database. If your University/Governmental Organization would like to join this inititiative or if you need more information please contact our helpdesk or your local librarian.